Over the years, there’s been a lot of debate about mechanical air filtration versus natural air filtration. In particular, people have argued if houseplants can compete with air purifiers for cleaning your indoor air. What spurred this debate was a 1989 study published by NASA that showcased the powerful air purifying capabilities of plants. That study raised a few solid questions. Are indoor plants enough to clean the air inside your home? Can an air purifier really purify the air better than a plant? Or are air purifiers just hype? In this post, we’ll tackle these questions and give you an honest answer to the air purifier vs houseplants debate. We’ll first start by explaining how air purifiers work to clean the air, then move onto plants, and end with a few tips on how to choose the best option for your own home. There are four basic types of air purifiers available. Each one works to purify the air indoors but in slightly different ways. 1) HEPA Filter: An air purifier that uses a HEPA filter cycles your home’s air through a dense filter that’s located inside the machine. Filters labeled as “True-HEPA” are by far the best type, and can remove 99.97% of contaminants down to 0.3 microns in size that pass through it. This includes particles such as mold, dust, pollen, and pet dander. 2) Activated Carbon Filter: An air purifier that has an Activated Carbon filter is specialized to remove airborne odors and volatile organic compounds (VOCs). It catches odor-causing particles such as cigarette smoke, cooking odors, and pet smells, as well as vapors from cleaning agents, chemicals, and paints. 3) UV Filtering: A UV filtering air purifier uses ultra violet light to destroy bacteria and viruses in your home’s air. It uses non-lethal radiation to break bacteria and viruses apart at the molecular level that pass through the machine. 4) Ionic Generation: An ionic air purifier doesn’t use a physical filter to trap indoor pollutants but rather sends ions out into the air to attach to any floating contaminants. When the ions attach, the particles get too heavy to stay in the air and fall onto the ground. You then have to vacuum them up to fully get rid of them. Some ionizers do include a collection plate to attract the falling particles but it doesn’t collect them all. Houseplants work primarily by absorbing carbon dioxide (CO2) from the air through their leaves. CO2 is then combined with water and sunlight to make carbohydrates that plants use to survive. During this process, known as photosynthesis, oxygen (O2) is released back into the air for humans and animals to breathe. Additionally, plants also absorb many other gases in addition to CO2, including volatile organic compounds (VOCs) such as acetone, benzene, and formaldehyde. In 1989, NASA performed a study on indoor air pollution abatement that verified how effective plants were at cleaning the air. VOCs can get into your home through a variety of ways including household cleaning products, paints, furniture, building materials, cosmetics, and hundreds of other sources. As you can see, indoor plants are a natural type of filter and can purify the air of harmful contaminants. It’s no wonder why the air purifier vs indoor plants debate is such a hot topic. Unfortunately, plants can’t absorb all forms of air pollution. Solid particles like dust, allergens, smoke, and pet dander simply land on the plant’s surface and surrounding soil. If you’ve ever seen a dusty houseplant before, now you know why that happens. If you’re familiar with plants, you may notice that these varieties are larger, and many are trailing Ivy plants. The larger surface area a plant has, the more contaminants it can absorb from the air. How Many Plants Do You Need to Purify Air? Although it’s not possible to answer the question “How many plants do I need to purify air?” in exact terms, you can follow a rule of thumb set by the NASA study. The recommendation is to use 15 to 18 plants that have a container diameter ranging from 6 to 8 inches for a 1,800 square foot home. To break it down into smaller terms, this works out to roughly one plant for every 100 square feet of floor space. For a 180 square feet bedroom, you would need at least two large houseplants for the best air purification. 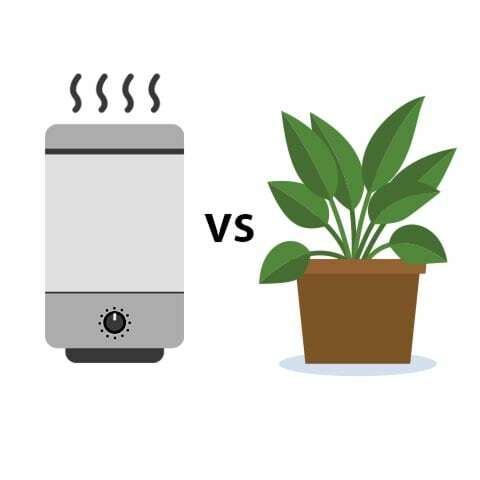 So, Which Should You Choose: Air Purifier or Indoor Plant? Now that you know how air purifiers and plants purify the air, you may not know exactly which side you should lean in the air purifier vs plants debate. Here are a few tips to help you decide. Here’s a list of the best air purifiers available which includes the top features pointed out for each one. We hope this guide has helped you make a well-informed decision when it comes to an air purifier vs houseplants. Regardless of the direction you choose to go, the air quality in your home will be much cleaner because of it.